Grilled chicken breast, hardwood-smoked bacon, bleu cheese crumbles, hard-boiled eggs, tomatoes and avocado on mixed greens. Served with garlic toast and choice of dressing. Six crispy onion rings served with Campfire Mayo and ranch. Your favorite finger food tossed with hard-boiled eggs, hardwood-smoked bacon crumbles, tomatoes and cheddar over mixed greens. Served with garlic toast and choice of dressing. Bleu cheese and bacon crumbles, crispy onion straws, diced tomatoes and ranch. Sea salted tortilla chips, salsa, house-made guac, fresh jalapeños, fire-grilled corn and diced red onions. 13 crispy onion rings with Campfire Mayo and ranch. Sea salted tortilla chips loaded with Red's Chili Chili™, two cheeses, house-made guacamole, house-pickled jalapeños, tomatoes, diced red onion, salsa and sour cream. Sprinkled with cilantro. Tender and crunchy - all-white chicken breast covered in your choice of sauce: Banzai with grilled pineapple pieces, Buzz with bleu cheese crumbles, Whiskey River® BBQ with crispy onion straws, or Island Heat with seared pineapple, fresh jalapeño and minced parsley - on a bed of Yukon kettle chips. Steak fries topped with Red's Chili Chili™, two cheeses, bacon crumbles, jalapeños, and ranch. Grilled chicken breast, cheddar cheese, tomatoes and cucumbers on a bed of mixed greens. Served with garlic toast and choice of dressing. Ancho-grilled chicken breast, black beans, avocado, fried jalapeño coins, tomatoes, onions, roasted corn, shredded cheddar cheese, lime and tortilla strips on mixed greens. Served with cream salsa-ranch dressing on the side. Chicken breast, romaine lettuce, and shredded parmesan with Caesar dressing and lemon with garlic toast. 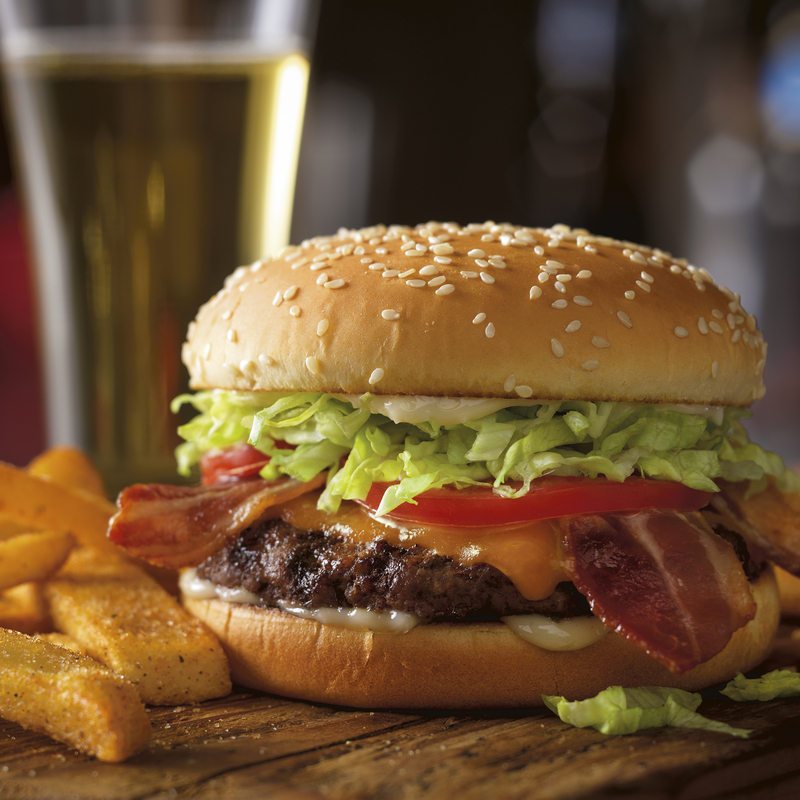 Served with Steak Fries® or Freckled Fruit® Salad. Sliced turkey breast, hardwood-smoked bacon, avocado, lettuce, tomatoes and mayo on a croissant. Sliced chicken breast, Whiskey River® BBQ sauce, cheddar, lettuce, tortilla strips and ranch in a spinach tortilla. Sliced chicken breast, parmesan, romaine, tomatoes, and Caesar dressing in a spinach tortilla. Chicken and vegetables with cheddar, sour cream and tortilla strips. 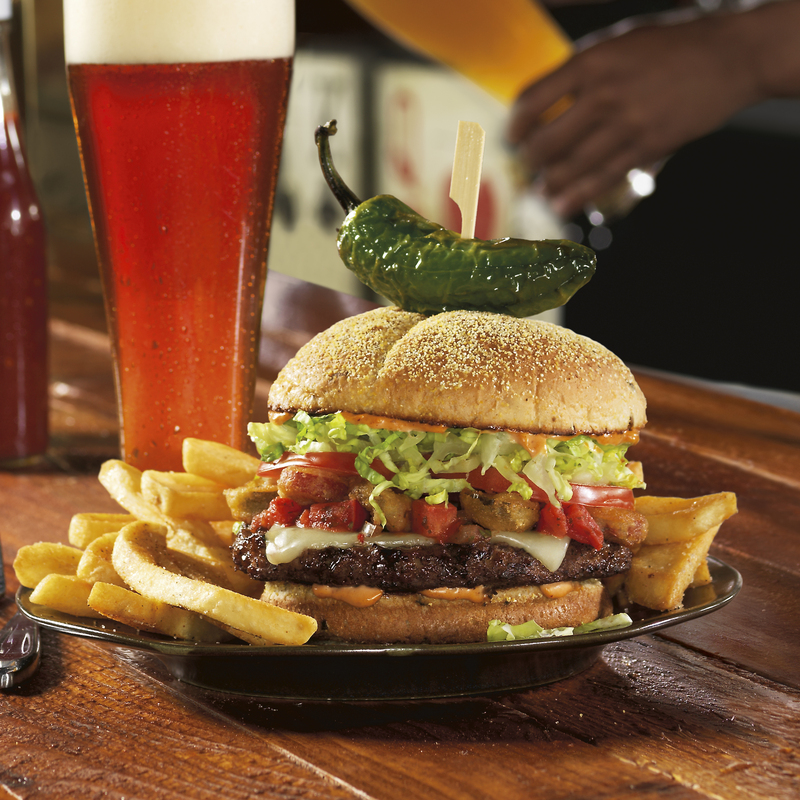 A fire-grilled, meaty blend of beans, spices and hearty peppers with cheddar, red onions and tortilla strips. All Burgers are served with Steak Fries®. Our finest lineup is made with premium ingredients, artisan touches and sophisticated flavors that deliciously elevate the burger experience. Your Choice of: 1/2 lb of fresh, never frozen Black Angus. An all-natural, cage free 7 oz chicken breast, or a 6 oz salmon fillet. 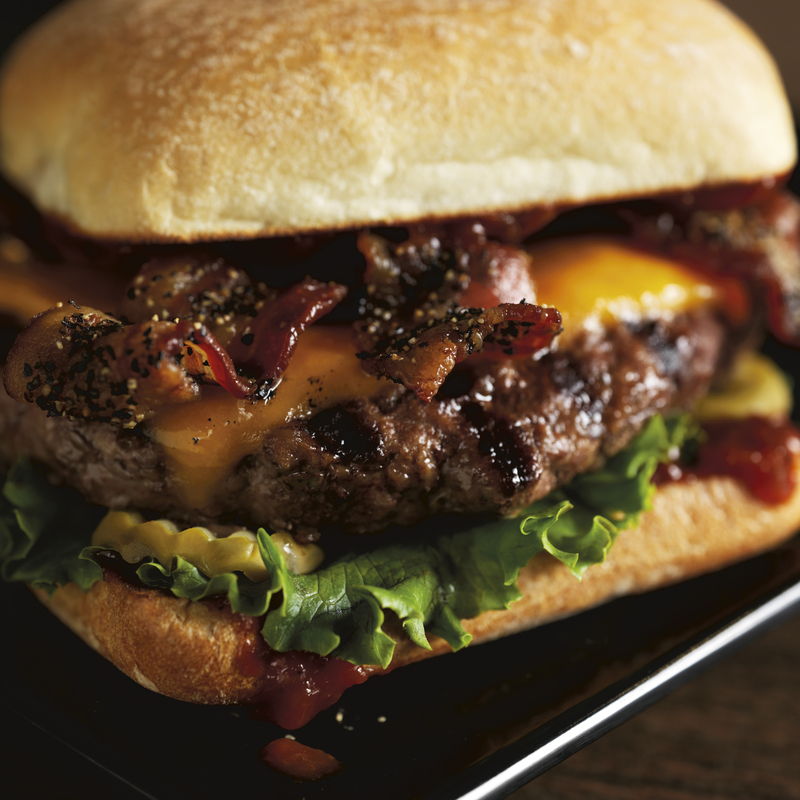 A 1/2 lb of Black Angus with black-peppered bacon, extra-sharp cheddar, lettuce, dill pickle planks and Smoke & Pepper™ ketchup on a toasted brioche bun. 1/2 lb brown-sugar-glazed Black Angus patty, candied bacon, Bourbon BBQ sauce, extra-sharp cheddar, caramelized onions, lettuce, and mayo on a toasted brioche bun. 1/2 lb Black Angus patty with a duo of melted extra-sharp cheddar and provolone cheeses, Bistro Sauce, dill pickle planks, lettuce and tomatoes on a toasted brioche bun. 6 oz lightly blackened salmon, roasted red pepper harissa aioli, crispy tempura lemon wheels, citrus-marinated tomatoes, red onions and arugula on a ciabatta bun. 1/2 lb Black Angus patty with sautéed and blackened portobello mushrooms, caramelized onions, cream cheese sauce, bleu cheese crumbles, lettuce, and roasted garlic aioli on a toasted brioche bun. A 1/2 lb Black Angus patty, a cheddar-and-parmesan crisp, provolone, swiss, jalapeño relish, candied bacon, avocado, citrus-marinated tomatoes and red onions with shredded romaine on a toasted brioche bun. All burgers are served with steak fries. 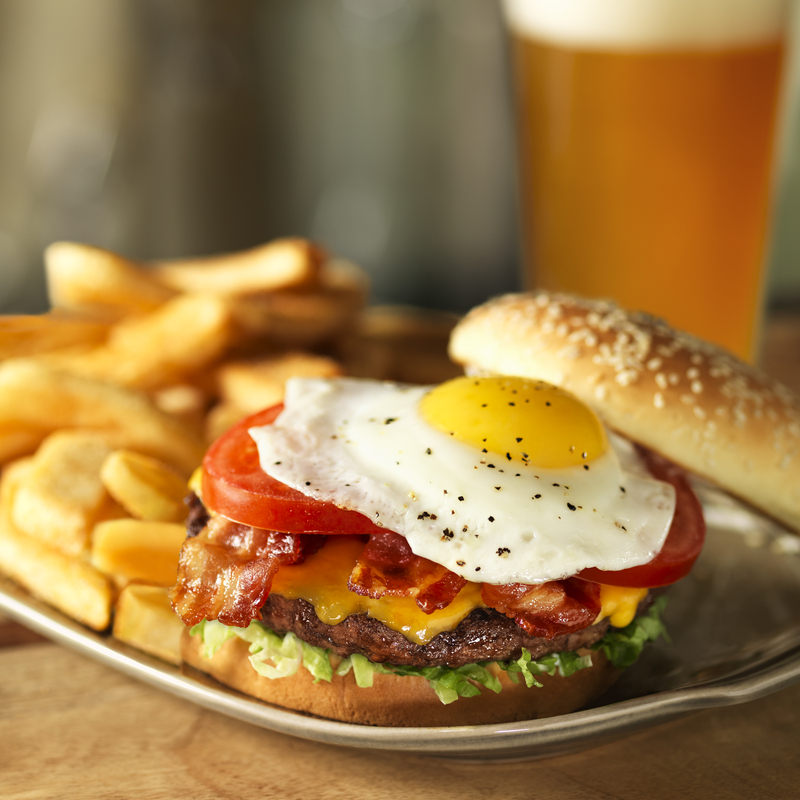 Hardwood-smoked bacon, egg, American cheese, lettuce, tomatoes, and mayo. Pepper-jack, A.1.® Peppercorn spread, hardwood-smoked bacon, tomatoes and crispy onion straws on an onion bun. Steak sauce, bleu cheese crumbles, crispy onion straws, lettuce, tomatoes and chipotle mayo on an onion bun. Red's pickle relish, red onions, pickles, lettuce, tomatoes, mayo, and your choice of cheese. Choose from our fire-grilled beef or custom-blended ancient-grain-and-quinoa veggie patty with lettuce, tomatoes, pickles and onions on the side. Served with your choice of Steak Fries or Freckled Fruit® Salad. 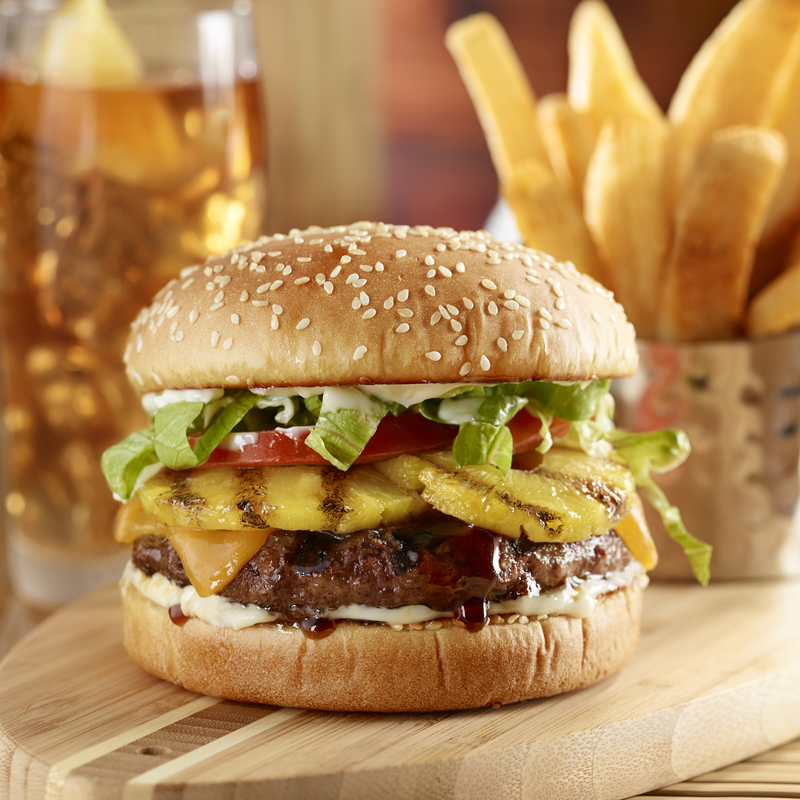 Teriyaki-glazed patty topped with grilled pineapple, cheddar cheese, lettuce, tomatoes and mayo. House-made guac, hardwood-smoked bacon, swiss, onion, lettuce, tomatoes and mayo. Hardwood-smoked bacon, house-made guac, tomatoes, and red onions in a lettuce bun. Served with a bottomless side salad. Sautéed mushrooms, gourmet steak sauce, provolone, bistro sauce and crispy onion straws on an onion-ring-topped onion bun. Fried jalapeño coins, salsa, pepper-jack, lettuce, tomatoes, and chipotle mayo on a jalapeño-cornmeal kaiser roll. 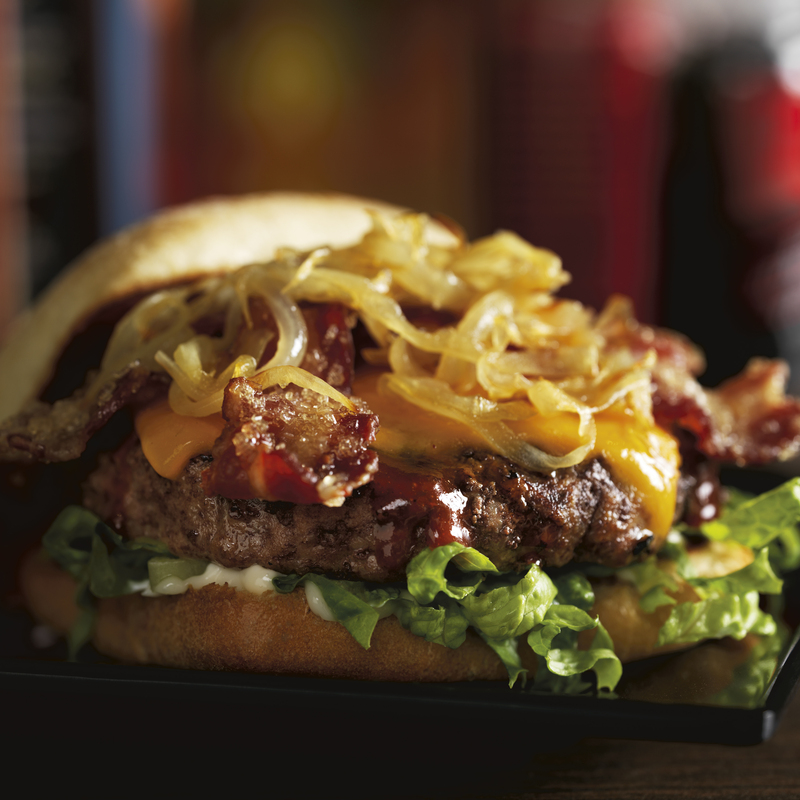 Bourbon-infused Whiskey River® BBQ sauce, crispy onion straws, cheddar, lettuce, tomatoes, and mayo. Our custom-blended, ancient-grain-and-quinoa veggie patty is piled high with Swiss cheese, lightly fried, parmesan-sprinkled mushrooms, tomato bruschetta salsa, fresh avocado slices, roasted garlic aioli and shredded romaine on a whole-grain bun. Seasoned turkey patty, lettuce, tomatoes, and chipotle mayo on a whole-grain bun. Pickles, onions, lettuce, tomatoes, and mayo. 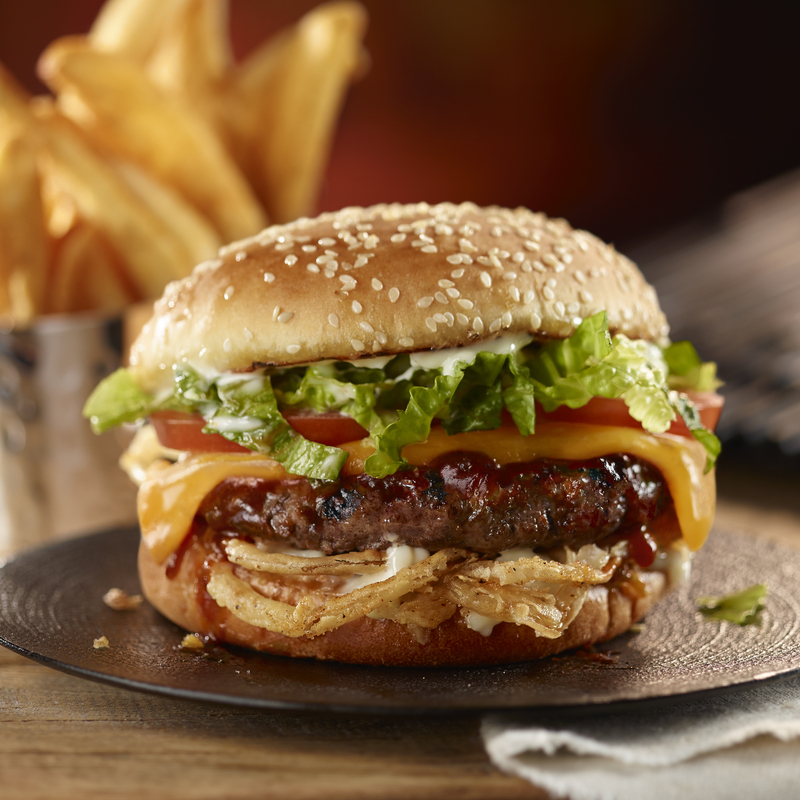 Whiskey River® BBQ Sauce, cheddar, crispy onion straws, lettuce, tomatoes and mayo. Bruschetta salsa, roasted garlic aioli, provolone, romaine lettuce, red onion and balsamic on a ciabatta bun. Pickles, lettuce, tomatoes and onions on the side. House-made guac, hardwood-smoked bacon, provolone, pickles, lettuce, tomatoes and mayo. Premium, hand-battered cod fillets featuring shredded cabbage, tomatoes, pickles and tartar sauce. Teriyaki, grilled pineapple, swiss, lettuce, tomatoes and mayo. They might not be burgers, but they're still loaded with YUMMM®. Lightly blackened 6-oz Salmon fillet, served with coleslaw garnish, and steamed broccoli. Crispy chicken tenders and steak fries, served with ranch for dipping. Also available Buzzard-style with bleu cheese dressing. Two ancho-seasoned chicken breasts, salsa and salsa-ranch dressing. Served with a mixed greens salad with cheddar, tomatoes and tortilla strips. 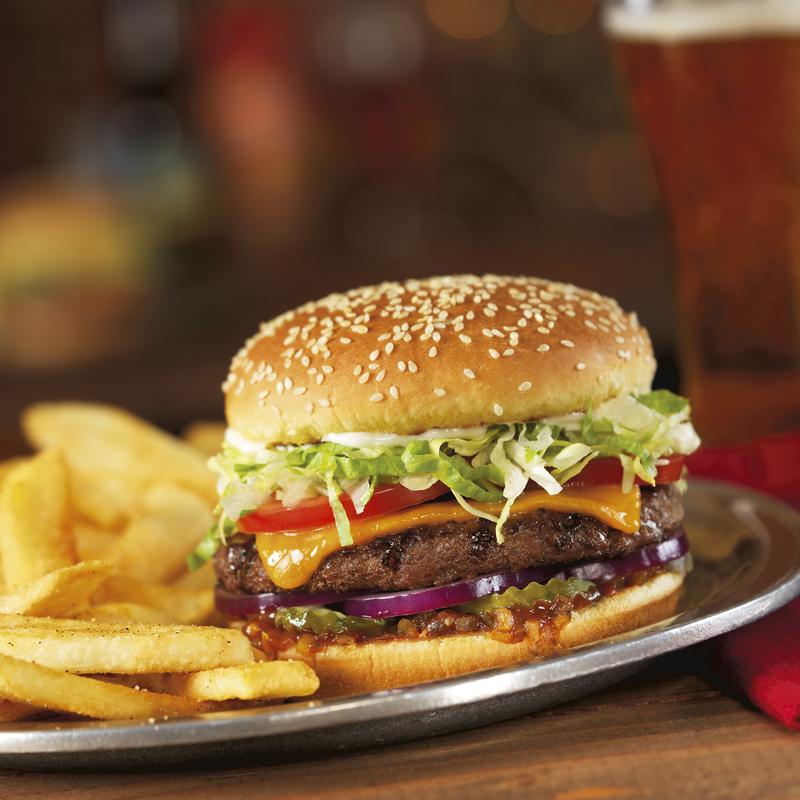 Our pub-style Tavern Double™ burgers are made with two of our classic patties and served with steak fries. Two classic patties topped with American cheese, Campfire Mayo, and onion straws. Red's Secret Tavern Sauce™, American cheese, lettuce, and tomatoes. Topped with house-made, bourbon-infused Whiskey River BBQ sauce, pepper-jack, pickles, red onion, lettuce and mayo. Fiery Ghost Pepper Sauce, pepper-jack, fried jalapeño coins, fresh jalapeño, lettuce, and tomatoes. Ranch, bourbon-infused Whiskey River BBQ sauce, crispy onion straws, American cheese, and lettuce. Pasta, creamy cheese sauce, toasted crouton crumbs, parmesan and parsley served with a side salad or caesar salad. Our spin on a classic grilled cheese with swiss, provolone, and cheddar melted over rustic Italian bread and topped with Parmesan-and-Cheddar-Crusted bread. The refreshing blend of Minute Maid® Lemonade and strawberries that made us famous! Pucker up! Raspberry and lime fruit flavors, Sprite®, and a lime wedge. The Drinkable Dessert! Bottomless Barq's®, and soft serve. A delicious blend of candied orange and Sprite®, topped with whipped cream. A delicious blend of wild raspberry and Sprite®, topped with whipped cream. An indulgent blend of sweet and salty deliciousness. A delightful combination of chocolate and OREO® cookies. Blended with peppermint candies and marbled with white chocolate sauce. Topped with whippe cream and crushed peppermints. Chocolate hazelnut spread and cocoa crisp deliciousness. Topped with chocolate whipped cream, cocoa crisps and Chocolate Fruffles. Toasted mini marshmallows, graham crackers crumbs and chocolate syrup topped with whipped cream and fudge-dipped graham crackers. Coconut cream, pineapple juice and soft serve with whipped cream and a cherry. A creamy blend of strawberries, bananas, grenadine, coconut cream, and pineapple juice. Sip to the beat of your heart - or a steel-drum band. Chocolate brownie cake with hot fudge and berry sauce, served à la mode. Eight cinnamon and sugar croissant donut rings served with caramel and fudge. Chilled, dark-chocolate-dipped fudge brownies with French sea salt, sugar crystals and berry "ketchup". A mountain of chocolate and vanilla ice cream, layered with Oreo cookies, fudge, caramel, and whipped cream. One classic patty topped with American cheese, Campfire Mayo, and onion straws. Beef, grilled chicken, turkey, or veggie patty, with American cheese and lettuce, tomatoes and pickles on the side.